Y’all know how I feel about people-watching. Even more than watching people, I love making up stories about them. Some stories I share, some I keep to myself. Last week, we were on one last beach adventure, not far from Augusta, before the start of school. A large group of us amassed on the sand. There were twelve adults and even more kids. We had music blaring, baseball and soccer games playing, crabbing, fishing, sand castling, magazine reading, seagull shooing, and anything else people do on the beach. It was a happy chaos, and the perfect ending to summer vacation. Each day, we’d meet after lunch, setting up tents, coolers, and chairs and stay on the beach until dinnertime or later. We spent a lot of time counting kids. Between the counting, I soaked it all in. The weather was gorgeous. It wasn’t that humid, with cool 88 degree afternoons. You heard me. That’s cool. At this time last year, it was over 100. On our first day there, I noticed an old man on his bike. It’s not an unusual scene on a low-tide beach, but he caught my attention. He was wearing shoes, a bathing suit, and a hat. He slowly rode to the surf. Hell, he did everything slowly. 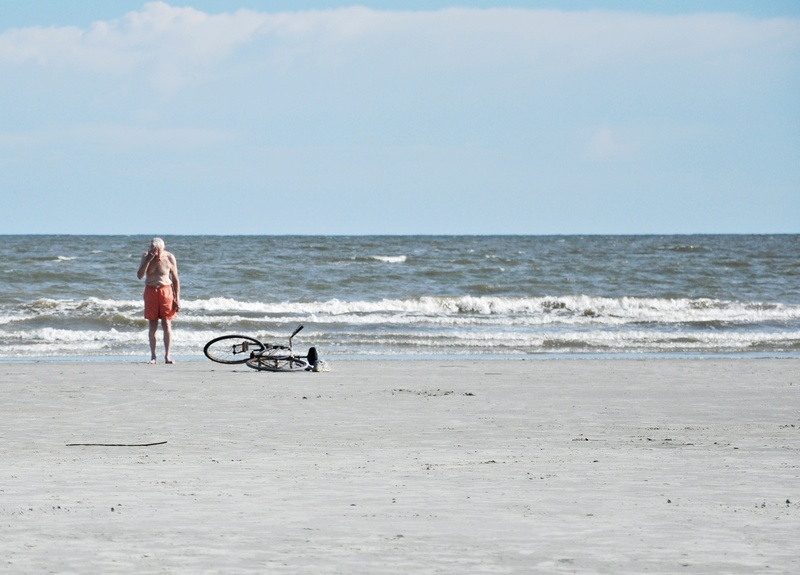 When he got to the water, he laid his bike on the sand and took his shoes off, his hat hanging on the handlebars. Apparently he does this several days per week. Maybe even every day. The other women I was with have seen him many times. People stop to talk to him, offering to help him get home. He says “thank you,” but he doesn’t need any help. He shakes their hand, smiling, and goes along his way. After he leaves his bike, he goes for a twenty or thirty minute swim. Its purpose may be exercise, but his pace is that of leisure. Or he’s just slow. Maybe it’s a little of both. Once he’s done swimming, he stands in the shallow waves and watches the swimmers. I guess he’s drying off before biking home. I’d like to imagine he’s thinking about something profound, but it’s probably more like, “Damn. Got sand in my shorts again.” Once he’s dry, he grabs his shoes, and rides his bike home. With much of his life behind him, he has nothing left to do but enjoy every minute. He takes his time. Why rush? Maybe it’s because The Kids were about to go back to school, but he fascinated me. I’m sure I’m not the only one, but I spend much of my life rushing from here to there, always looking forward to the next thing. Counting days to the next holiday or trip. What if I could reverse that? I’m not sure it’s possible. As They (The Royal They with all the answers) always say, life moves too fast. Children grow in the blink of an eye. For some reason or another, mine seem especially big this school year. The Boy will turn ten. Ten. He’s not old enough to be ten. I’m not old enough to have a ten year old. He can’t wait. The Girl, though only seven, wants to be a grown up. Just tonight, she said “Mama, I can’t wait to be your age. Then I can cuss like you do.” Ahem. Sure, tragic events help keep things in perspective. Every day, we hear stories of families affected by terrible illness or an accident. Those who know them tell us how quickly life can change and how we shouldn’t take anything for granted. I wish we could be more like the man on the beach, enjoying life simply because it’s what we do. If we could only figure that out before it’s all we have left to do. It’s too late to apologize for my sappiness, so I’ll leave you with this: hug your people, people. Go to the beach, too. Go for a swim, and ride your bike. Watch your kids learn to surf. Extend happy hour. The best may be still to come, but we can’t afford to miss this very moment.